Latticework refers to the thatch-like patterns made by overlapping narrow strips of wood. It is an effective private fencing option, both for fences bordering your property but also for privacy screens. 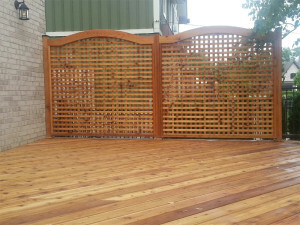 A lattice screen installation is more akin to a freestanding wall than a true fence and can be used to both add privacy to a space and help partition it, giving a sense of direction, shape, and focus to a garden or deck. Lattice screens and fences that are meant to provide privacy typically have one-inch or half-inch openings. When it comes to garden spacing, lattices are meant to support the growth of vines or other climbing plants, so the openings are around three inches. As with any yard or garden structure, hiring a contractor means your lattice screen is guaranteed to be built with expert talent and a craftsman’s eye. Total Fence Inc.‘s skilled contractors can build you the perfect lattice screen or private fencing to bring your yard or garden to life. Open diamond: This is likely the first image that comes to mind when it comes to lattice fences or screens. While traditional, this design is popular as it offers a simple elegance that can be complimented in a variety of ways. The openings not only support the growth of climbing vines or flowers, but man-made objects as well. For instance, a lantern can be hung to provide evening illumination. The topper: A lattice screen anywhere from a few inches to a few feet in height; it can be placed on top of a deck railing or atop a private fence to add both extra style as well as extra protection. This is popular on raised decks since it lets you look down into your yard without compromising the privacy provided by the upper sections. From below: If your deck is raised and you want something with extra flair to cover up the underside, a lattice screen installation is the perfect choice. Custom openings: There is a remarkable amount of variety in how you can frame the openings in your lattice screen. Star designs or theme images like animals, snowflakes, or clovers are an excellent way of personalizing the space and making something your visitors will find totally unique. Total Fence Inc.‘s contractors employ expert craftsmanship to build the best fences in Toronto. Our contractors regularly turn their talents to projects like lattice screens to better help our customers create the yard of their dreams. Click here to learn more about how we can design, build, and install the best lattice screen installation or private fence for you. For a free quote or a consultation, contact us today.